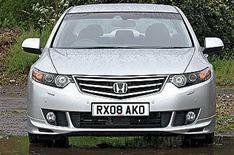 Honda Accord diesel gets auto gearbox | What Car? Honda Accord buyers will have the option of an automatic gearbox with the 2.2-litre diesel-engined car for the first time. It is the first automatic gearbox Honda has sold with a diesel. It averages 44.1mpg and emits 170g/km of carbon dioxide on the saloon, and averages 42.8mpg while emitting173-174g/km on the estate model, depending on its specification. The Accord i-DTEC auto goes on sale in January; with prices starting from 22,400.